For the first post that I wrote for the blog 2 years ago, I discussed some of the cool things that focused, high intensity light from a laser can do. For example, under the right circumstances laser light can change color (wavelength) when passing through certain materials. We use this cool phenomenon, called frequency doubling, to conduct experiments within the Center for Sustainable Nanotechnology. Lasers are used for a lot of great research being conducted at laboratories around the world. Recently I came across one example that really caught my interest: researchers at the University of Cambridge are using laser light like a needle to thread together nanoparticles. This is exactly what it sounds like. 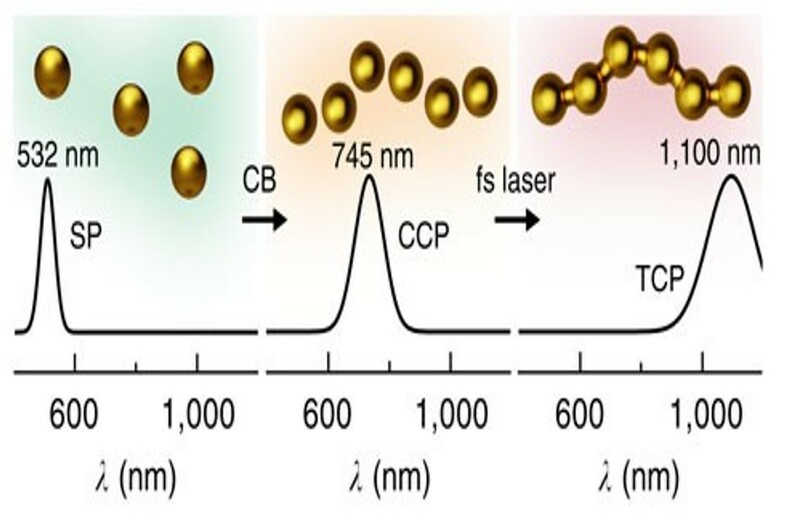 Gold nanoparticles are exposed to laser light, and can then fuse into a string of connected particles, like a strand of pearls, as seen in the cartoon above. When the string of nanoparticles is formed, the way the particles respond to light changes, which is shown in the data below the cartoon. The green section in the figure represents the gold nanoparticles as they are when they’re first made, dispersed in a liquid. The orange section represents the second step, when a barrel-shaped molecule called cucurbituril is used to bring the particles close together in a strand. This step is crucial to controlling the spacing between the particles. Finally, the pink section represents the particles after the laser light is introduced and the particles have fused together. These threads could not be formed by sunlight that hits the surface of the Earth or light from a lamp in your house because you need a lot more energy in a small amount of time than you can get from everyday sources. To cause this type of phenomenon, you need laser light. The laser that they use to form these strands sends very brief pulses (one millionth of one billionth of a second) of very high energy onto the gold particles. This causes only the surface of each particle to melt, without destroying the entire particle. This means that the surfaces of the particles can then fuse together, forming the strands. So, what are the implications of this work? Nanomaterials assembled in different ways have numerous potential applications in renewable energy technologies, electronics, and sensing, any of which could make for a whole other blog post. An important part of this specific work is the use of laser light to assemble the particles into a string in a precise and easy way. As you can imagine, assembling nano-sized objects that we cannot see with our eyes alone can be challenging, especially if we want to do the process on a large scale. The work described here allows for very precise assembly of particles. The authors have assembled different sizes of nanoparticles and made different lengths of strings, and can even control the amount of area on the particle that is in contact with its neighbor. All of these properties are controlled by simply changing the laser power and the color (wavelength) of the laser light used. A Real Life Invisibility Cloak? Now this is where things get really fun. A potential application of precisely controlled nanomaterial assembly could score you your own Deathly Hallow. Yes, the widely desired invisibility cloak. Being able to engineer materials on the nanoscale makes it possible to produce metamaterials. Metamaterials are materials that have a precise shape, size, or arrangement of atoms that can transform waves of light or sound into a form that is not observed naturally. With metamaterials, it isn’t just the atoms that the material is made of that dictate its behavior, but the way those atoms are arranged. And yes, one area of metamaterials research includes invisibility. Remember, as mentioned above, an assembly of nanoparticles interacts much differently with light than do dispersed nanoparticles. This means that you could arrange atoms, molecules, or particles in a material in such a way that light moves around it as if it isn’t there. Researchers at the University of Rochester are already doing some similar things using lenses. 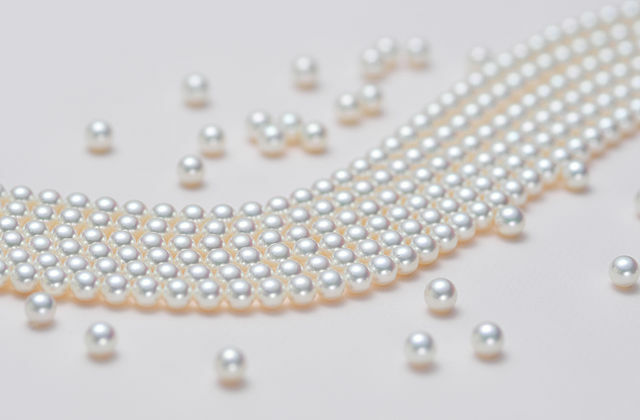 These new string-of-pearl nanoparticle threads may not yet allow for invisibility, but precise control of nanoparticle assembly is a step in the right direction! For an educational activity appropriate for ages 4 and up, check out “Exploring Properties – Invisibility” from NISEnet.